This page has been set up to contain the latest information available on the situation at Machampane as a result of the flooding caused by the tropical storm, Dando. Updates will be added as they are received. For further details, please phone the booking office on +27 21 701 7860. 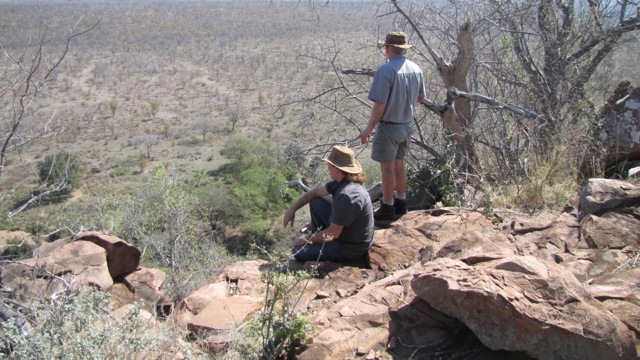 Hennie reports that Machampane will be up and running for guests again from the week-end of 3 February 2012. Until 25 February we will only have 4 tents available. Well done to the Machampane team for some back-breaking clearing and organisation. Latest road status: The Giriyondo border post is open and fully operational. KNP has graded the road to the border post and the sections of the road what were washed away have been repaired to such an extent that it can be used without a problem. 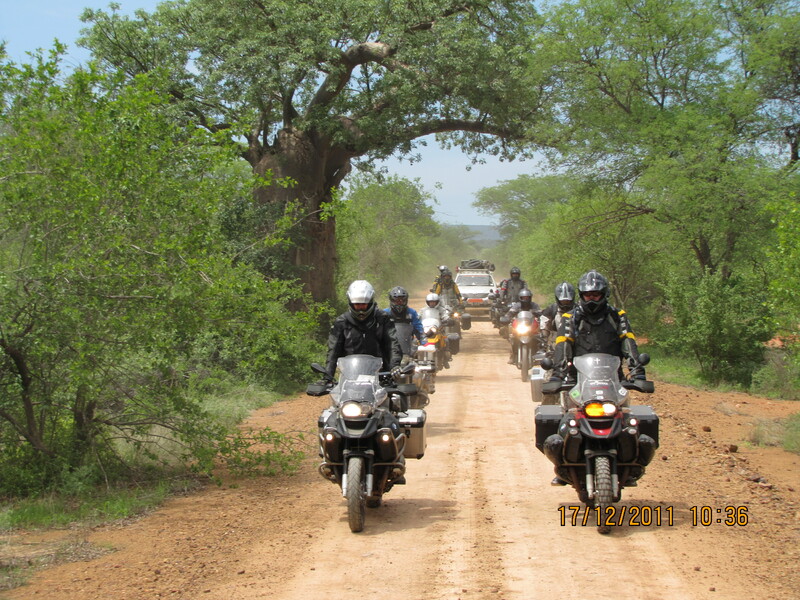 The road in PNL to Massingir can also be used without any problems. The river crossing at Machampane is still under water and about 400mm deep. As the river is still flowing, it is unlikely that the level will drop soon. This means the camp is only accessible to vehicles with very high ground clearance i.e. Land Rovers and Land Cruisers. Giriyondo border post is open, as is the road from Letaba to Giriyondo. There have been extensive wash-aways on the road and Kruger do not recommend the use of the road. Only high-ground clearance 4x4s are advised if you need to travel through. The road through PNL is wet and muddy, and requires careful driving, but has not been washed away. 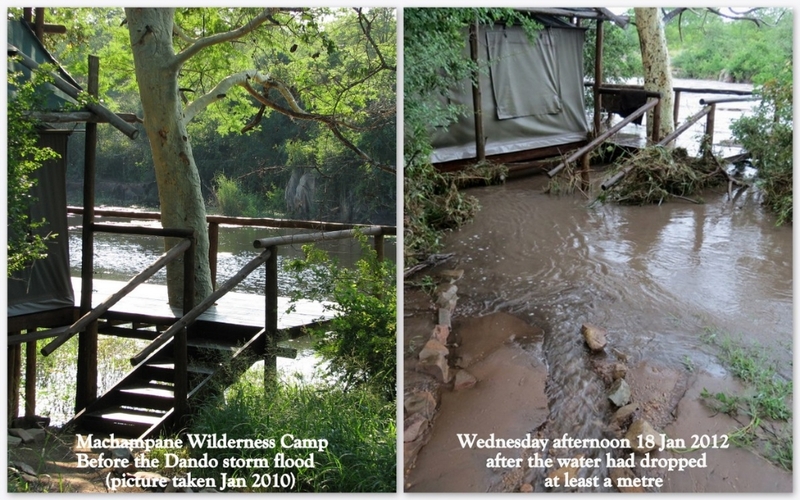 Machampane Wilderness Camp is currently closed to visitors as we clean and repair flood damage. A re-opening date will be published shortly. By now you would all have seen some of the pictures taken during the past 48 hours in Machampane. It is heart breaking to see the brilliant effort Kieran, Denise and Theresa has put in spring cleaning the tents recently, to all be “washed away”. At first glance we think it make take at least 14 days to get the tents cleaned out and repaired. The good news is that we today managed to get the clients out safely. They only had the highest praise for Kieran and Denise who handled the whole situation very well, never panicked and always had the clients safety as first priority. The clients also mentioned that notwithstanding the very difficult circumstances, they did not even miss out on a single meal. Giriyondo is open again, but the dirt road to the border post has been washed away and damaged badly in certain places. For the moment only high clearance 4×4 vehicles can get through. There is no obvious major damage at the border post itself. News just in that our guests arrived safely at Letaba Camp, collected vehicles, and are currently en-route to their planned overnight accommodation outside Kruger. Our manager (and excellent wet-weather 4×4 driver!) is on his way back to Machampane to spend the night with the staff who are still at the camp. All staff will be moved out tomorrow to get to dry accommodation, and somewhere to refresh. Mopping up operations start in earnest as soon as the water levels have dropped slightly. Photos and guest stories to follow. Our guests are on their way out in 4×4’s via Giriyondo. Special arrangements have been made between the authorities of both Kruger and Parque Nacional do Limpop, as well as the customs officials at Giriyondo to clear stranded travellers, and our guests are currently being treated to a (we hope) once in a lifetime experience of wet-weather 4×4 travelling. The best KNP officials can give us on Giriyondo is that “it is closed until further notice”. Nobody can at this moment can give any indication as to how long it will be closed. It sound like the road to the border post, in the area of the picnic site has been totally washed away. Report from Machampane is that even if the border does open, the camp will not be ready for a few days. All the guest tents were flooded and it will take at least a week to ten days to get it all cleaned, dried, broken items repaired, etc. At this stage there appears to be no infrastructural damage. This is one of the great advantages of the low-impact timber decking building at the camp. But before those mopping up operations begin, our immediately concern is to get the clients currently stuck in camp out and back to their vehicle in Letaba camp. We are dealing with officials at both Kruger National Park and Parque Nacional do Limpopo to work out the best course of action. Latest report from Machampane is that the rain has stopped about two hours ago and that the level of the river has dropped by about 1 metre to under the decks of the tents. They are able to use the main kitchen and dinner is being prepared. Tropical storm “Dando” has hit Machampane and the catchment area of the river. As at 2pm three of the guest tents and the kitchen were flooded, with no prospect of rain letting up. Guests and staff have moved into staff accommodation which is on higher ground. Everyone is safe and wet. Giriyondo Border has been closed, as has the Phalaborwa entrance gate to Kruger.